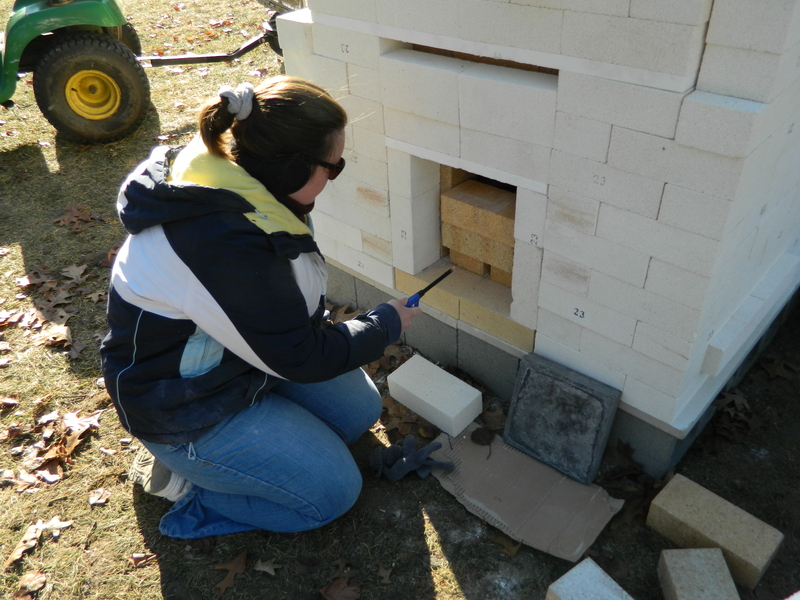 Our first kiln firing had one main purpose and that was to fully cure the castable refractory so they wouldn’t be damaged or degraded by the freezing temperatures. However, a secondary purpose was to attempt to reach cone 10 (2345F) with a very light load of three pieces of pottery. 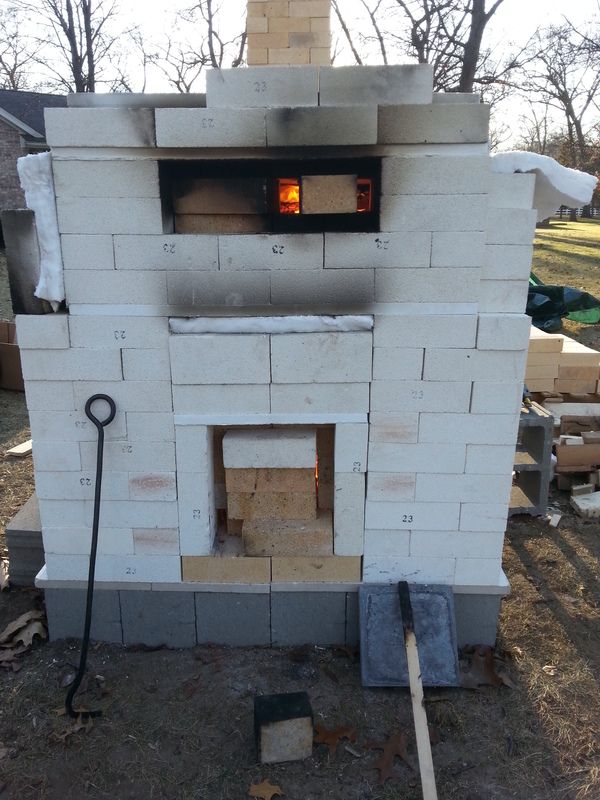 While the castable refractory has a very specific ideal temperature profile for the first heat up it was unrealistic to meet it with a wood fire. We just took it slow and let the water turn to steam on the surface during the first several hours. Since we were looking for cone 10, we used cones 10, 11, 12, and 13 in four places in the kiln (four spikes inline in the photo). In order to prevent everything from sticking together due to the wood ash a wadding compound needed to be mixed. This was made from a mixture of wet clay, sawdust, and sand from the kid’s sandbox. 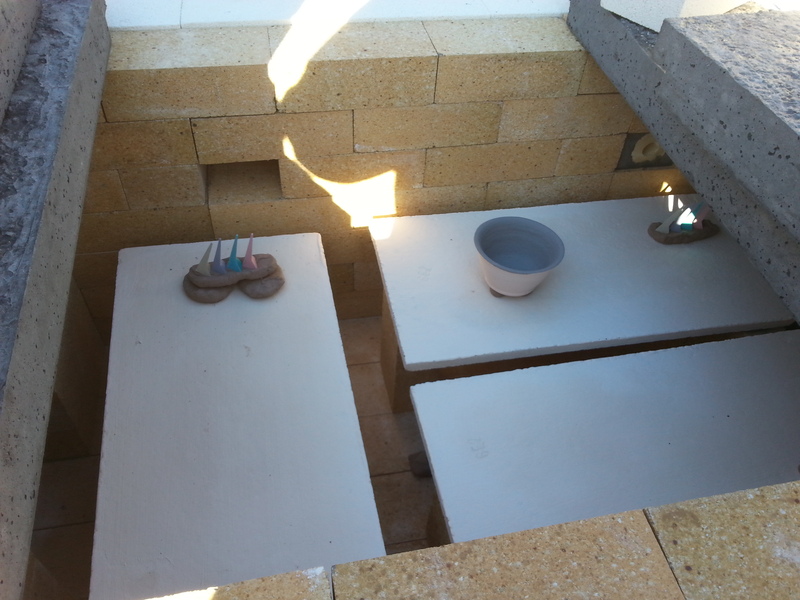 It was placed under the kiln shelves, under the pottery, and was used to support the cones. Initial shelf placement, before closing up the kiln it changed and only two shelves were inside (minus the shelf on the left). On December 31st at 11:30am Karen did the honors and lit the fire. The fire was lit just above the mouse holes and not on the hobs with small pieces of wood. The fire was not moved up to the hobs until 90+ minutes into the firing. During the first few hours there was more smoke coming from small gaps in the firebox than there was from the chimney. Once a piece of Cerablanket was used to cover the firebox, the smoke was 99% escaping through the chimney. Fire burning on the hobs just a few hours in. At this point there are no more good pictures of the firing since the sun was going down. However, several notes were gleaned from the firing log and included below. – By 4:00pm the temperatures in the front peep hole was on the order of 850F while in the back it was 1250F. – First hot coal clean up was at about 5:00pm but should have occured prior to that. – At 9:00pm flames now regularly shoot out of the top of the chimney during and after stoking. Flames also shoot out of the primary air inlet during stoking. The flame route to the top of the chimney is on the order of 18′ and with around 2′ shooting out of the chimney, the total flame length was 20′. Stoking was occurring on the order of every 20 minutes late in the firing. – At 9:00pm it was 16F outside and fairly windy. – At 12:50am on January 1st the temperature was 2130F. – At 6:00am we closed up the kiln and quit for the first firing. The temperature reached a peak of 2285F, just short of our goal. While we didn’t hit cone 10, the cone was slightly bent and we estimate that we reached cone 8. 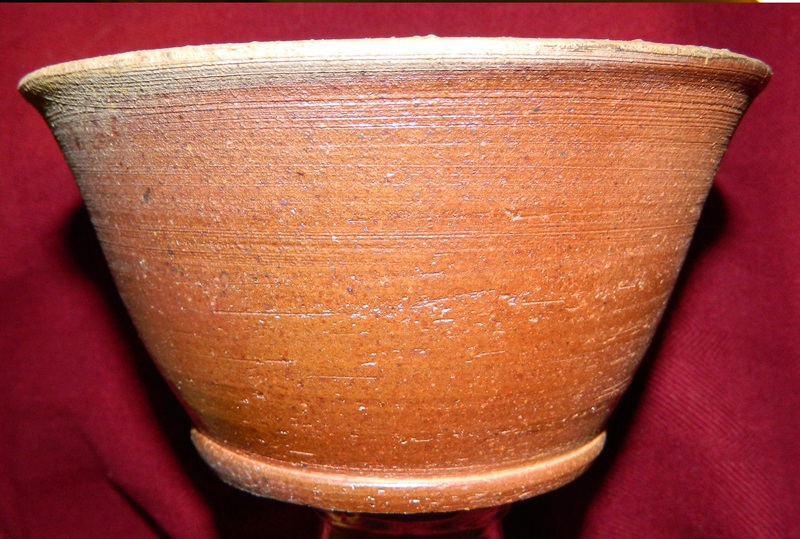 The pottery and glaze in the chamber needed to reach cone 6 as a minimum but the ash deposits would have benefited by a higher cone. During the last few hours we were stuck between 2200F and 2300F. The total firing time was 17.5 hours. – The firing consumed only about 0.25 cord of wood. Several reasons for not reaching cone 10 include ambient weather (very cold and quite windy), firebox door being too heavy and stoking taking too long, firewood size was too large, chimney should be taller, hot coal cleanout taking too long, and most significantly we were very tired! Plans are in place to make a few minor changes to get that last 100 degrees although waiting until March will get us most of the way there! After the firing the true performance of the insulation could be gauged. 28 hours after the last piece of firewood was charged in the low temperatures (mid-teens) outside with fairly heavy winds, the kiln was still at 700F. Peep holes were opened and some insulation removed in order to accelerate the temperature down below 400F in the next six hours. After 400F was reached we fully opened the kiln up to discover the condition of the pottery and cones. Below was one of three pieces of pottery in the kiln. Left without glaze the clay body is expected to be white. The outside of the bowl was not glazed but the ash buildup and subsequent melting gave this piece a red hue. 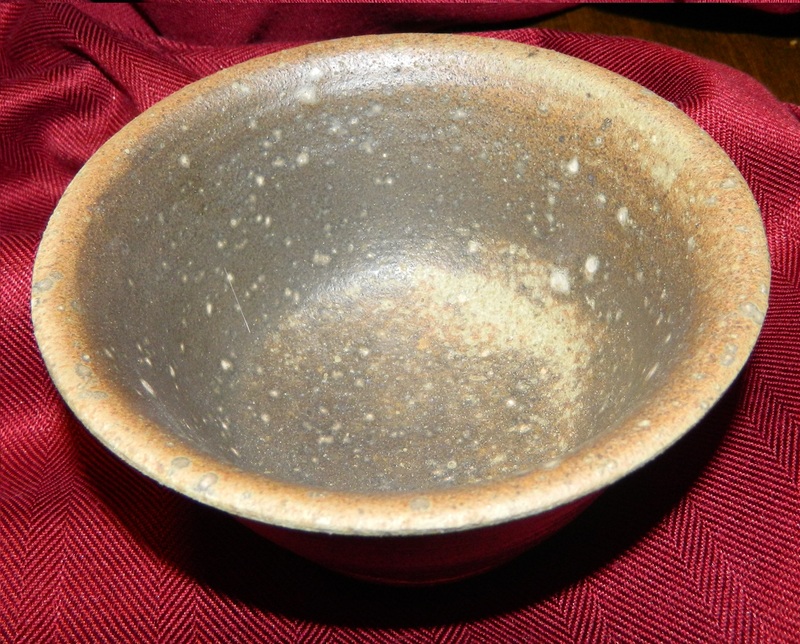 The inside of the bowl was glazed with a dark honey colored glaze. The variation in color and the white splotches are a result of the wood ash deposit. The first firing was regarded as a success! Significant learning was experienced as was a lot of fun although warmer weather would have improved things!